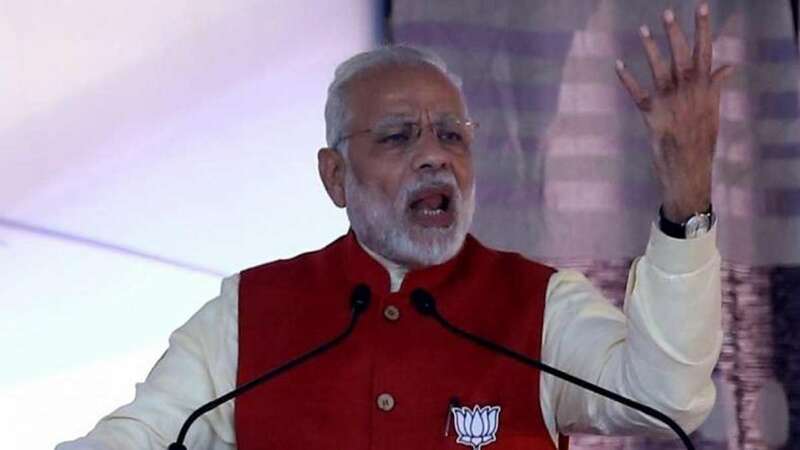 Kotkapura : Prime Minister Narendra Modi on Sunday invoked threats from Pakistan to urge people to vote for the Akali Dal-BJP alliance in Punjab to provide a strong government in the border state. Modi warned people not to vote for parties who were eyeing to form the government for their vested interests. "Punjab a border state. Pakistan always looks for opportunities to destabilize Punjab. If a weak government or a government of outsiders or a government of those indulging in luxuries comes, this will be bad for Punjab and the country," Modi said in this town of Punjab's agricultural Malwa belt, 225 km from Chandigarh. "We have to ensure that we have a strong government. You have to ensure that you vote properly." Elections to 117 assembly seats in Punjab take place on February 4 with the main contest being among the Akali Dal-BJP combine, which has been in power in Punjab since 2007, the Congress and the Aam Aadmi Party (AAP). Modi warned people in Punjab against being misled by the Congress. "Congress leaders painted all Punjab Sikh youth as terrorists. Now Congress has called all Punjab youths drug addicts. Save Punjab from people who will drag the state back to the dark days," Modi warned. In an obvious reference to the Congress and the AAP, Modi lamented the declining standard of language being used during campaigning in Punjab. "I am pained to hear what all things are being called for Punjab Chief Minister Parkash Singh Badal," Modi said. "Very wrong words are being used for him (Badal). This is dictatorial language. Can democracy work like this? If democratic traditions are broken, it will be bad for the country. People who have done injustice to Anna Hazare, do you think that they will show regard for Badal?" He said that in his political life he had held two leaders, Atal Bihari Vajpayee and Parkash Singh Badal, in high regard as they never talked ill of anyone. "We should learn from these leaders how to conduct in public life. We have also fought against the Congress. But we do not talk saying that we will send so and so to jail," he said. He said the AAP leadership, instead of finding faults with the Election Commission and alleging that the EC was dancing to his (Modi's) tunes, should focus on its work. "They (AAP leaders) will lose in Punjab and Goa because of their own actions (karnamas)," Modi said. Lauding Badal for public service in the past seven decades, Modi said: "Badal only thinks and talks of Punjab and its people and farmers." The Prime Minister dwelt at length on the new schemes and policies introduced by his government at the Centre for the benefit of farmers. These include micro-irrigation, crop insurance from natural calamities, modernizing agriculture through technology and others. Modi also assured that the Central Bureau of Investigation (CBI) will fully investigate the incidents of the sacrilege of Guru Granth Sahib and bring the culprits to book.